Harry Potter and the Deathly Hallows — Part 1, the penultimate film in the Potter franchise, is the best Harry Potter film to date. It is a heart-stopping, violent, and utterly frightening adaptation of J.K. Rowling’s series that never wavers in its depiction of the violence that plagues the wizarding world. I don’t need to get that into the plot; by now I would expect you to know what happens in the Harry Potter books and films. Dumbledore’s death at the close of Half-Blood Prince has led to the collapse of the wizarding world and to questioning about the wizard’s life. (“Did you even know him at all?” someone asks Harry.) What should be happy moments — Bill and Fleur’s wedding, Harry’s burgeoning romance with Ginny Weasley — are cut short by the dangers of the war and the Nazi-like state created by Voldemort. 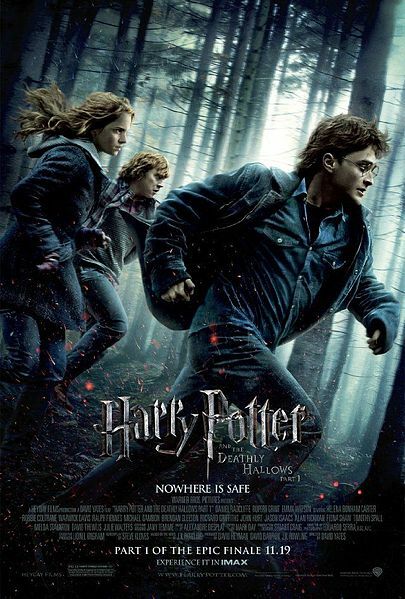 Harry (Daniel Radcliffe), Ron (Rupert Grint), and Hermione (Emma Watson) set out on an arduous journey to find the Horcruxes, the items where Voldemort has divided his sole, and destroy them. They have nothing to guide them anymore except some seemingly useless clues from Dumbledore: a snitch, a deluminator, and a copy of children’s fables. They only have each other but that relationship begins to falter because of a lack of progress, their isolated life in hiding, and Ron’s jealously. Dealthy Hallows is building up to the final showdown between Harry and Voldemort (as always, played perfectly by Ralph Fiennes). Every scene — the fast-paced escape from the Dursley’s; Dobby’s much-adored reappearance; the brilliant, macabre animated short of “The Tale of the Three Brothers” — has been executed so that the finale is everything that it has been advertised to be: epic. With David Yates behind the camera, the Harry Potter franchise has matured and developed a necessary consistency. The first four movies provided context and established the series brilliant characters, brought to life by some of the best thespians. But these movies lacked a certain artistry and cohesiveness that Yates brought as the series became more emotional and bleaker. Now about that controversial added scene. After Ron leaves the trio, Harry and Hermione dance. For a few minutes they engage in a goofy, frivolous act that ends with a short pause and a look. If Yates wanted to frame Harry and Hermione as a romantic pairing, this would have been the moment to do it. But the pause and stare between them would have to linger for longer than a second. Instead Hermione turns away quickly; the brief moment of joy she experienced is still no match for the private anguish she has gone through this journey. For the audience too, the scene serves a pivotal purpose. This is the darkest, most violent Harry Potter film to date. The blood and deaths will only increase in the final film and the final battle scene bodes to be the most harrowing moment of the films. It is also a reminder that these characters who we have watched for almost a decade now are not the adults we sometimes think them to be. They are still teenagers figuring out how to be normal while dealing with, you know, having to save the world. July 15 cannot come soon enough. Next Next post: I Am Harry Potter!